Advanced Allergy Relief of Kansas uses new, breakthrough technology that eliminates the reactions from most forms of allergies and sensitivities. Advanced Allergy Therapeutics (AAT) has only been in the US for seven years, originating in Australia over 20 years ago! We are the only location in all of Kansas that provides this technology, and our allergy specialists are highly trained and certified for this breakthrough treatment. AAT is non-invasive; there are no needles, no drugs nor any pain involved in these treatments. AAT also does not use herbal remedies or supplements, instead using a combination of advanced technology and 3,000-year-old Acupuncture techniques. Every substance in this world has a particular, unique frequency. 25,000 frequencies have been discovered and entered as digital signals into a database to represent the most common allergens people have difficulties with. When testing we use the computerized digital signals from that database to simulate a substance that we then transfer to your body through a cuff (like a blood pressure cuff) on your arm. We do this in combination with muscle testing, which allows us to test through your muscles which substance makes you weak and which substance has no negative impact on your body. The substances which make you weak are allergies. Allergies come about when the body is in a weakened or lowered state, resulting from conditions such as a virus or other illness. The immune system reacts to the virus appropriately by attacking it, because it is a foreign substance which is hurting the body. The symptoms of that attack could be a runny nose, upset stomach or skin condition, for example. Now let's say you are intaking a lot of wheat while you are enduring that virus. The immune system inappopriately associates wheat with the virus, thinking that it is a bad foreign substance that is causing your body to be sick. So it attacks the wheat, and every time you come in contact with wheat from then on, the immune system attacks it. This results in symptoms such as a runny nose, upset stomach or skin condition, for example. To treat the allergies we find, we use a combination of the digital signals and a handheld device (which takes place of acupuncture needles) to recondition your body to recognize the allergen as something that is not harmful to your body. Not only is this procedure not painful and not invasive, but our clients usually find the reconditioning to be relaxing and pleasant. After we detect the problem, we can basically fix one family of allergens per visit. We can work with any age from infant to elderly. We have had remarkable success with this technology. Call us at 316-440-1000 to get more information. You can also visit our website at www.allergyreliefofkansas.com to check out our success stories, make an appointment and find out more about our Advanced Allergy Therapeutics technology. 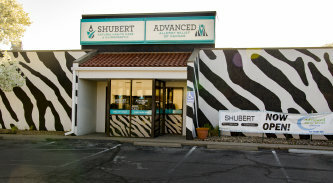 At Shubert Natural Health Care & Chiropractic our purpose is to improve, extend and save the lives of as many people as possible by preventing the use of needless drugs and surgery. We do this while helping people to get healthy and stay healthy - naturally! We get to the core of your health conditions instead of merely trying to make the symptoms disappear. In order to do this we use the "Six Steps to Wellness" program, which encompasses structure (chiropractic), emotions, allergies, electrical pollution, toxins and nutrition. We offer a large variety of natural services to not only provide tremendous relief for our patients, but to help their bodies to heal from whatever is ailing them. Usually the first service we provide in order to diagnose what is going on with your body is a Total Health Scan. A Total Health Scan involves muscle response testing, consisting of touching specific reflex points that correlate with certain organs. The scan allows Dr. Shubert to determine which natural medications and/or other natural treatments you will need in order to get your body back to its natural, functioning state. There are no negative side effects to our natural medications, only positive side effects. You heal one area of the body and other areas will respond happily. We usually re-exam every four weeks to check on improvement and the possible need for other treatments. The Total Health Scan checks the adrenals, liver, gallbladder, leaky gut, upper gastrointestinal, cortisol, heart, homocysteine, thyroid, parathyroid, spleen, pancreas, yeast, parasites, immune system, bladder, gonads, pituitary gland, brain, colon, lungs and kidneys. Visit our website for a full list of our services and their detailed descriptions. Some of our many services are listed below.